Are the Welsh/ American/ German outbreaks much different from the French? Scream the headlines. Unvaccinated children are being excluded from Swiss schools; private clinics are running out of single measles jabs……What are they panicking about? Heart attacks, strokes, paralysis? No, they are talking about measles – a regular childhood illness that most children sail through. Are children in Europe and the United States suffering from malnutrition? Does your child have HIV/AIDS? If not, why all the fuss? 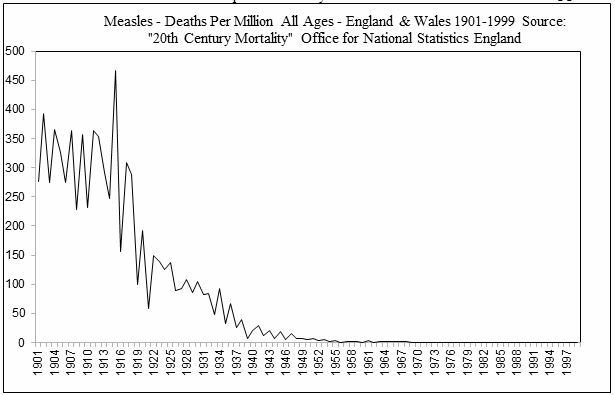 In the UK, measles used to occur in epidemics about every two years starting in the autumn with the peak being in April and then waning for another two years.2a In the nineteenth century when social conditions – malnutrition, poor housing, drinking water contaminated with sewage – were similar to those in poorer countries today, it used to be a feared killer here also. But all that changed long ago. 99% of the reduction in deaths due to measles in England & Wales occurred before the introduction of the measles vaccine in 1968 and has continued to fall since then. Fig3. In fact measles and other childhood infections were so much regarded as part of normal childhood development in the 1960s that mothers sent their children off to measles, mumps, chicken pox and rubella ‘parties’ so that they would get them at the best time – in childhood. They are now described as so likely to cause death or disability that the only sensible choice is to vaccinate. The incidence of measles cases also declined. Great credit was given to the introduction of measles vaccine in 1968 for the lowering of measles notifications in the UK, however, the uptake was only 33% in that year. The level that did not get above 55% until 19805 when incidence was already well down. What happens, then, when unvaccinated children get measles? Measles outbreaks in unimmunised people tend to be mild in those who do not have underlying medical conditions. In communities which generally do not immunise, the attack rate in infants less than one year of age is low because of protection by the superior maternal antibodies derived from natural infection compared to those derived from vaccination 6. Almost without exception, deaths occur in those with underlying medical conditions or poor nutrition or in those religious groups who refuse timely medical care when complications occur. 7 Those most at risk of complications from the disease are also those least likely to produce a good antibody response from being given the vaccine. MMR vaccination started in the UK in 1988 with a second dose added in 1996. Nevertheless, in the first five months of 2011 almost 500 cases of measles have been notified. In France, from having less than 50 reported cases of measles per year, there was an increase to 600 in 2008; 1500 in 2009; 5000 in 2010 and 10 000 cases up to the end of April 2011. Having measles is not a problem in itself. The problem is the cases of pneumonia and encephalitis with two deaths in 2010(1 death /2500 notified cases) and six deaths so far in 2011 (1 death / 1666 notified cases). There haven’t been case fatality levels like this in the UK since the 1950s! In terms of health outcomes, we seem to be going backwards! The measles cases are not coming from abroad. The European Centre for Disease Prevention and Control states that less than 10% of European Union (EU) cases are imported and more than 60% of those, come from another EU country8. So we are talking about generally well fed and housed people with a clean water supply. Then why are they suffering complications or dying? How you treat the illness. Whatever the state of your immune system, you get complications from not treating infectious diseases correctly. The first step in this process is to recognise that the infection is not your enemy but your friend. From an holistic point of view, diseases causing fever and rashes are regarded as detoxifying processes, enabling the body to clean itself out and go up a developmental step. Suppression of such processes is thought to lead eventually to long term, chronic illness. How are people with measles generally treated? The first thing that children are given is paracetamol or ibuprofen to reduce their fever – despite the fact that the WHO don’t recommend it and the NHS NICE Guidelines 2007 state. GPs recommend it six hourly, in hospital it is given four hourly, alone or in combination (even though NICE advise against using paracetamol and ibuprofen together). Antihistamines are given for itches and coughs; antibiotics are given when there is no bacterial infection – just in case; children are fed, over heated and kept in stuffy rooms – is it any wonder that they get complications? And this is just what is happened in France. France has had the Measles Mumps Rubella (MMR) vaccine since 1986 with coverage of over 90% for the first does and 40-70% for the second dose11. So instead of children being able to get measles, mumps and rubella at a beneficial age there is now an epidemic of measles sweeping across the country where 8% of cases are under one year old and 34% are over 20 years12, when complications are more common. This is compared to 1963 (England & Wales) when less than 4% of cases were under one and 0.4% of cases over 20 years old. Worse, it seems that no-one knows how to nurse a case of measles any more. In 2010, 30% of cases were hospitalised (38 % under one year, 47% over 20 years). In 1963, 1% of cases in the UK were sent to hospital and 13% of those were for ‘social’ reasons. Even more incredible, of the cases admitted to French hospitals, only 30% had complications! If they don’t have complications (and even if they do) why one earth would anyone in their right mind send someone with measles to hospital? When you have measles the disease (or the vaccine) it lowers a part of your immune system, known as ‘cell-mediated’13. This makes you susceptible to infection by other organisms – so the very last place you should be if you have measles is in a hospital, full of sick people, infectious diseases and MRSA. Six out of ten deaths from measles are from pneumonia. The main complications of measles are infections. Is it any wonder that there have been six deaths already this year? There is also the vitamin A factor. How can you make sure your child has enough Vitamin A? So what about the single measles vaccine? I was called in June 2011 by a distraught mother in the UK whose son had had a single measles shot. He had a history of milk protein intolerance from birth, reflux and inflammatory bowel problems. “He was OK with the first set of baby vaccines but had a bad fever with the second and was worse with the third. He had settled down by the time he was due his 12 month vaccines (at that time, Hib and meningococcal C) so he had them, and he got really ill the next day. He had an encephalitic cry (high pitched screaming) and fever. It took seven days to settle and lots of paracetamol for the fever. After loads of research we decided not to give him the MMR. He’s now two and a bit and is OK, apart from the medications for reflux and diarrhoea,but because of the measles epidemic that is happening around here, I got so scared that I decided to give him the single measles vaccine. He was fine for the first week, then, on the eighth day he was playing on the floor when he looked up at me strangely, and then he started screaming and screaming with that high pitched cry– like before. He was beside himself. He felt really hot. I took him to the A&E Department where they gave him paracetamol. He had fever on and off for the next three days with screaming. We gave him lots of paracetamol. On the third night the fever stopped. We’re now many days after that and he’s still very different. Can you help? Was it caused by the vaccine? Your child has an underlying condition and the vaccine just revealed the predisposition that was already there – it would have happened anyway. However, if a child with an underlying condition suffers severe complications or dies during an episode of measles, it is always the measles that is blamed. In addition, there is no reliable systematic monitoring of vaccine adverse reactions in Europe. “Implementation of vaccine registers and monitoring systems for adverse events following immunisation are a priority for EU member states”18, meaning they aren’t implemented yet, nevertheless MMR is still said to be “the safest way to protect your child against measles”, though this is hard to believe when adverse reactions are not appropriately recorded. Are there any benefits to having the measles? A study conducted by the Danish epidemiologist Tove Rønne and published in the Lancet in 1985, found that having measles with a typical rash was associated with a lower incidence of developing immunoreactive diseases, sebaceous skin diseases, diseases of bone, cartilage and certain tumours in adult life 19, unlike the ‘atypical’ variety with suppressed rash that occurs in people with immune disorders and after vaccination. Early exposure to measles and family size may be associated with a lower risk of adult onset doctor diagnosed asthma21. Sensitivity to housedust mite was less frequent in children with a history of measles than in those without. A history of nebulized salbutamol use in A&E in the previous 12 months was less frequent in the measles group. Inhaled corticosteroid use was more common in the group without measles (these all indicate lower incidence of asthma in the measles group)22. Are we trading a generally benign childhood illness for a chronic disease with a higher death rate when we try to eradicate measles and suppress fevers? What should you do if your child develops measles? Put them to bed, open the window (preferably nurse them in the garden), give then plenty of clear fluids and NO FOOD unless STARVING.26 You might want to give them some homeopathic remedies or keep them in a darkened room. I remember lying in a boiling hot room in the dark, many years ago when I had measles as a child in Bahrain. It was horrible. But at the end of it I had good quality antibodies which have kept me immune from measles ever since, I was able to pass them on to my children when they were babies – and I don’t have asthma either. However, advocating a healthy lifestyle is not an option that the Department of Health or GPs offer to parents who ask what they can use as a viable alternative to measles vaccination. Please note that almost every reference referring to measles quoted in this paper recommends that children are vaccinated against measles. All references for which there is a link were last accessed in June 2011. 2a Brincker JA A Historical, Epidemiological and AEtiological Study of Measles (Morbilli; Rubeola): (Section of Epidemiology and State Medicine) Proc R Soc Med. 1938 May;31(7):807-28. http://www.ncbi.nlm.nih.gov/pmc/articles/PMC2076936/?tool=pubmed. 13 Shaheen SO, Aaby P, Hall AJ, Barker DJP et al, Cell mediated immunity after measles in Guinea-Bissau: historical cohort study, BMJ 1996; 313:969-74 (6a) Aaby P et al ‘Long-term survival after Edmonston-Zagreb measles vaccination in Guinea-Bissau: Increased female mortality rate’ The Journal of Pediatrics 1993;122:904-8. 14 Sudfeld CR, Navar AM, Halsey NA.Effectiveness of measles vaccination and vitamin A treatment. Hi, I just wanted to write to thank you for the very clear, concise information you offer regarding measles and the vaccinations on your website. It gave me the courage and information I needed to stand up for myself when the medical profession challenged my choice about not having the MMR for my twin boys and now they have contracted measles it has given me the information I need to treat them. Despite the horror stories that the Department of Health and the doctor’s surgery has tried to fill me with, it has been easy to nurse them and they have not been unduly affected by having measles and seem to be very quickly on the road to recovery. Another example of how the medical profession’s propaganda fills you with fear over an illness that in most cases is extremely manageable. Thank you so much for offering this information free of charge. You may find it informative to read of other people’s experiences while making a decision about what to do for yourself or your children. These are, of course, only one side of the debate, but you can easily access other opinions by listening to the radio, watching TV, reading the newspapers or the Government/ Department of Health’s advice, or visiting your GP/ Paediatrician/ Practice Nurse or Health Visitor. So, what happened subsequently. At that time the single measles vaccine, the single vaccines were available freely on the National Health Service. Otherwise, I would not have suggested that option. So parents, if they were legitimately concerned about the safety of MMR could go and get the single vaccines. Six months later the British government unilaterally withdrew the importation licence for the single vaccines therefore depriving parents of having these on the NHS; depriving parents who had legitimate concerns about the safety of MMR from a choice; denying them the opportunity to protect their children in the way that they saw fit. And I was astonished by this and I said to Dr Elizabeth Miller of the Health Protection Agency why would you do this, if your principal concern is to protect children from serious infectious disease. Why would you remove an option from parents who are legitimately concerned about the safety of MMR. And her answer was extraordinary. She said to me if we allow parents the option of single vaccines it would destroy our MMR programme. In other words her concern, her principal concern seemed to be for protection of the MMR programme and not for protection of children. Now, were parents concerns about the safety of MMR legitimate? Did they have a reason to be concerned? The answer is unequivocably yes. When the MMR was introduced in the UK in the late 1980s there were three brands that were introduced. Two of those three brands had to be withdrawn hurriedly four years later because they were causing meningitis in children at an unacceptable rate. In other words two thirds of the licensed vaccines in the UK had to be removed from circulation because they were dangerous. And what is very disturbing about this and this was brought to my attention by a government whistleblower, Dr Alistair Thores, who was working at that time for the Joint Committee On Vaccination And Immunisation, the regulatory body in the UK. He made it clear to the British government that they should not use those dangerous vaccines. He made it clear to the committee prior to the licensing of the MMR in 1987. Why? Because he was brought in from Canada where they were already having problems with this vaccine under the name Trivirix, the identical vaccine to the vaccine which was introduced into the UK under the name Pluserix. And there they had noticed that there were cases of meningitis which were far in excess of those which they had previously seen. This meningitis was being caused by the mumps strain; Urabe AM-9. And so he advised the Joint Committee not to touch this vaccine: it was dangerous. They ignored his pleas and they went ahead and introduced it anyway. Four years later it had to be hurriedly withdrawn because it was causing precisely the complication that he had warned them of. Moreover, they were asked, David Salisbury specifically, was asked to allocate funds to active surveillance of adverse events. For the government to go out there and to look and ask doctors if they had seen cases of this meningitis. He said no. That was denied and they relied on passive surveillance: in other words the spontaneous reports coming in from doctors and hospitals. That is known to pick up perhaps 1 to 2% of true adverse reactions. In other words it was going to inevitably underestimate the true numbers of this reaction. Hence, the delay of four years for the removal of a vaccine that should never have been licensed in the first place. It was with that background and with that insight into the practices of the Joint Committee of Vaccination and Immunisation that I took the stand that I did on MMR. I was deeply and justifiably concerned. So the next question is beyond the fact that MMR vaccine is not safe and has not been adequately tested; not just my opinion but the opinion of many; is does MMR vaccine cause autism? Now this question has been answered not by me but by the courts, by the vaccine courts in Italy and in the United States of America where it appears that many children over the last 30 years have been awarded millions of dollars for the fact that they have been brain-damaged by MMR vaccine and other vaccines and that brain-damage has led to autism. That is a fact. Now it has been argued by the government that some poor judge has been forced into making this decision that on balance the vaccine caused the autism in the face and in contradiction to the evidence that is available, the scientific evidence. No. That is grossly misleading. Three of these cases at least least; Poling, the Italian case, and more recently the Mojabi case, have been conceded by the government experts. In other words the government experts, the government themselves have conceded that the vaccine cause the autism. They didn’t fight the case. They conceded it based upon the evidence available to them – all of the evidence – that the MMR vaccine caused the child’s autism. So this isn’t some poor judge being forced into a position in the absence of the evidence or in contradiction to the evidence. This is the government’s own experts conceding that the MMR vaccine caused the autism, or caused brain damage in this case that led to be autism. And what we have are millions of dollars being paid out to these children to fund their autism treatment so when the government says it is not settled cases of autism, please bear in mind that what they’re paying for the costs of the autism treatments. The government if it says that is speaking out of both sides of its mouth. So let me turn now specifically to the measles outbreak in South Wales. The outbreak that the government is alleging is my responsibility, which is clearly in the face of the evidence from Lord Howe in Parliament and for which originally I suggested protection against measles with a single vaccines. Now it is very important for people to bear in mind that MMR doesn’t protect against measles. Measles vaccine protects against measles. The mumps and rubella components are irrelevant. So, if single vaccines were available; if the government had not withdrawn the availability of a vaccine, then there would be no outbreak of measles in Wales, there would be no discussion of measles cases and potential measles deaths. So, the blame for this must lie on the shoulders on those who withdrew the option of the single vaccine from the parents who were legitimately concerned about the safety of the MMR. Not because of me but what had happened because of that vaccine long before I came on the scene. But there is one problem. There is one contradiction. That is as Lord Howe has said in Parliament, MMR vaccine uptake is at an all-time high. So why are we now seeing measles outbreaks in highly vaccinated populations. It would be very interesting to find out how many of those children in the current outbreak have actually been vaccinated. I suspect many. And this has been seen before. One of the problems I think we are encountering is that of vaccine failure; primary and secondary vaccine failure. Primary failure – not enough children respond by developing immunity to the vaccine in the first place and secondary vaccine failure – those that do develop immunity that immunity disappears very quickly over time. And this has been seen with mumps vaccine. The mumps vaccine does not work and we are seeing similar outbreaks of measles (mumps) in vaccinated populations. And this is one of the long-term problems of using live viral vaccines over time, taking seed stock virus and repeatedly using it and using it and using it over time that it seems for some reason to lose its potency. And what we’re seeing now is what I believe is unintended, unexpected consequence of long-term use of these live viral vaccines; and that is vaccine failure. And that is something that is really really concerning. It is not theoretical. It has been seen unequivocally with the mumps vaccine. And I believe we are now seeing it with measles. If that is the case then 1) blaming me for the outbreak of this measles case come measles cases in South Wales, is totally inappropriate. It is not addressing the core issue of what you do about live viral vaccine failure, because if the viruses is then infecting people at an older age than the outcome may be more serious and there are no therapeutic interventions for protecting those people from measles. So the government has in effect put all its eggs in one basket and now we’re seeing measles come back. That is my belief. What we face unambiguously is an epidemic of autism; an environmentally driven epidemic of autism now alarmingly affecting one in 31 boys in the United States of America and I saw data from Yale just the other day from South Korea showing that one in 36 children in South Korea are affected by this lifelong severe neurodevelopmental disorder. There is the true epidemic. Do we see attention being paid to that in anything like the same way that the media are applying attention to the measles outbreak in South Wales. No we do not. That is the true epidemic. And that is the one that we really have to deal with as a matter of urgency. Now what I would like to do, I have been, Dr David Elliman has said that this was my fault and I understand that this morning he went on the news and he was saying that the media were responsible for the latest sort of debate, the latest argument, by giving me some kind of voice. So he is able to make this very very serious allegation against me and then deprive me of the opportunity of responding in the media. That is an extraordinary situation in what is supposedly a free country. What I’m suggesting is a formal scientific debate in public in front of an audience that is televised. And specifically Dr David Salisbury I would like to debate you because I believe you are at the heart of this matter. I believe the decisions taken by you and by your committee, the Joint Committee on Vaccination and Immunisation, lie at the heart of this matter. There are many things to debate with you. I’d like to debate with you specifically why you have denied repeatedly that there was any form of indemnity for the manufacturer of the Urabe containing vaccine Pluserix when it was originally introduced; why you have denied that. And I have here Dr Salisbury are the unredacted minutes of the Joint Committee on Vaccination and Immunisation held on 7 May 1993 and here in these minutes it says “once SKB” that is SmithKline Beecham “continued to sell the Urabe strain vaccine without liability”. How Dr Salisbury do you explain the term “without liability” in that context. It seems to me that this was something that was disclosed to me by your whistleblower from the government, from your own committee, who said the deal was done with the manufacturer to exempt them from liability for introducing the vaccine that they had concerns about because they were already having problems with it in Canada where it was then withdrawn. I would also like to put it to you, I would like to ask you why you felt it necessary to contact the General Medical Council and urge them in the strongest terms to prosecute me more vigorously; indeed to admonish them for not prosecuting me more vigorously. Do you feel that was an abuse of your governmental position introducing inevitable bias into the General Medical Council. And since you are at the heart of this matter and have been according to your curriculum vitae from the very beginning, the introduction of MMR into this country, it would seem to me that you are the perfect person to debate this in public with me. And if we can exonerate MMR vaccine from causing the problems which I believe and many parents believe it is causing them that is all well and good. But that will only be resolved in an open scientific debate. And therefore I think that the time has come for you and I to have that discussion.